Graduated from Palmer Collge Of Chiropractic, Davenport Iowa in 1992. Member of the Joplin Chamber of Commerce. Member of the Missouri State Chiroprators Association. Member Christs Community United Methodist Church. Front desk receptionist, She will be answering your phone call. Susie has been with Advanced Health & Rehab since 2006. Ongoing chiropractic care can make a noticeable and amazing difference in how you feel and function. Our desire is to see our practice members abandon the prevailing sickness care model of health (waiting for symptoms and then taking action), in favor of the emerging wellness model (maintaining health with the idea of preventing illness and symptoms). It’s your body, your health and your future. Our job is to offer you the finest chiropractic care possible, and it’s up to you to decide how much of it you want. Sound interesting? Do you want Relief? Wellness? Please Call: 417-782-2504 today to make an appointment. Don't let neck pain, back pain, headaches or injuries from a car accident ruin your life. 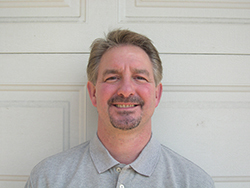 Dr. Lewis is a spinal rehab specialist, he has worked with a medical doctor, physical therapist, massage therapist together in a multi-specialty clinic and knows what works. Call Susie today for a complimentary consultation so we can start to relieve your pain.